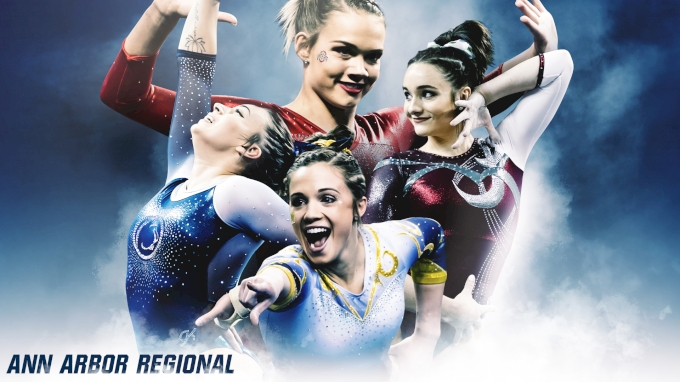 Tune in to watch the final day of competition in Ann Arbor, right here on FloGymnastics. In the first session, Alabama and Michigan were dominant and did not let mistakes prevent them from scoring high. Alabama finished first with a 197.225, while Michigan finished second with a 196.950. Both teams earned an event total above 49.000 on each apparatus, and had an event high score of 49.425. The Crimson Tide were best on floor and finished the meet strong with three scores of 9.900. The Wolverines were best on vault where they had great lineup score progression, beginning with a 9.800 and finishing with a 9.925. Penn State finished third in the first session and had great performances on bars and beam with a 49.125 on both. The Nittany Lions ended their season with a 195.750. Ohio State had to dig deep after injuries prevented some gymnasts from competing, but the team finished strong. The Buckeyes had a season-high 49.175 on vault to end their 2019 season in fourth place in the first session. Their team total was 194.725. In the second session, UCLA was so dominant that it was able to finish first with a 197.675 without Kyla Ross competing in the all-around and without Katelyn Ohashi's floor routine. The Bruins scored a 49.375 or higher on every event and were able to utilize their depth in preparation for tomorrow's competition. Nebraska was able to score well, at least a 49.100 on each event, and be consistent to finish second with a 196.800 to advance to the regional final. The Huskers had a few mistakes but didn't let those affect the rest of their lineups as they counted no score lower than 9.725. 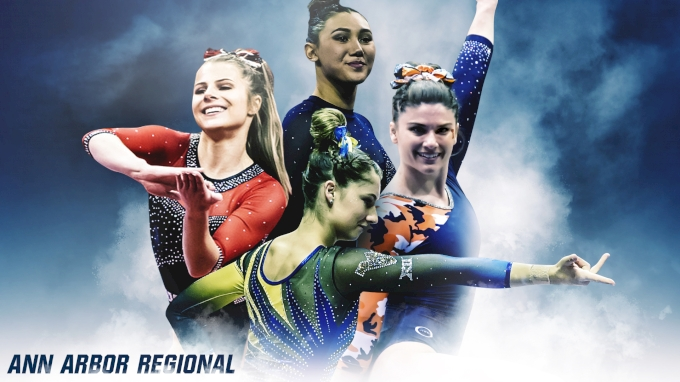 Illinois finished third after consistent performances gave the Fighting Illini their second-highest score of the season with a 196.175, but they couldn't put together a strong enough rotation on vault to beat Nebraska. West Virginia finished in fourth with a 195.425, its fifth best regional score in program history. The Mountaineers had strong performances on bars and beam with near-49.000 totals but couldn't compete with the other teams' higher scores. One of the best vaults from session one was from Alabama's Shallon Olsen, who competed a difficult Yurchenko double for a 9.900. The Tide also had strong vaults from Ariana Guerra, who earned a 9.925. Michigan had an excellent vault rotation to begin their meet and counted five scores above 9.850. Natalie Wojcik continued to be a fantastic vault anchor for the Wolverines with a 9.925 Yurchenko 1.5. The best vault of the entire meet, and especially the second session, was a perfect 10.0 Yurchenko 1.5 from UCLA's Kyla Ross. This is the ninth consecutive meet Ross has gotten a perfect score. Also in the second session, Nebraska's Taylor Houchin had a perfect Yurchenko 1.5 in two judges' opinions but scored only a 9.975. A few gymnasts from session one also did well on bars, including Michigan's Olivia Karas, Alabama's Shea Mahoney, and Penn State's Sabrina Garcia, who all received a 9.900. Half of the Bruins' beam lineup scored 9.900 or higher on beam. Ross and senior Katelyn Ohashi each earned near-perfect 9.950s while senior Brielle Nguyen matched her season-high 9.900. The first session also had a handful of 9.900s on beam from Alabama's Emily Gaskins, Penn State's Jessie Bastardi, Karas, and Towson individual competitor Mary Elle Arduino. Freshman phenom Natalie Wojcik earned the highest floor score of both sessions with a 9.925. 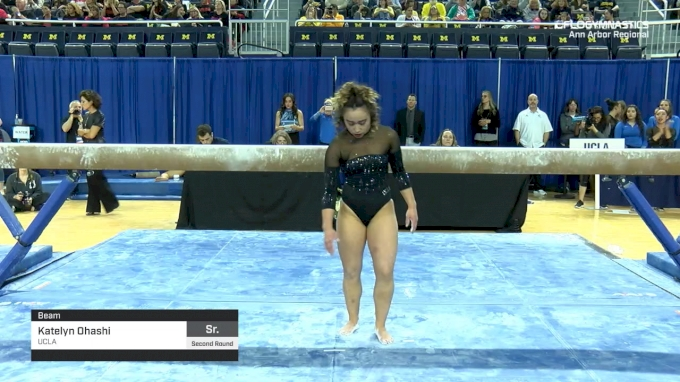 Michigan competed just five routines on floor. It didn't need to put up a sixth gymnast to advance to tomorrow's competition and elected to give Lexi Funk some rest for tomorrow. Also in the first session was a trio of great floor scores from Alabama as Maddie Desch, Abby Armbrecht, and Lexi Graber each earned a 9.900, giving Alabama its highest event total of the day. In the second session, UCLA's Pauline Tratz and Gracie Kramer also scored 9.900.